The counter top- Chop the almonds and the dry cush. Add the cocoa butter melted and the compote. Mix them and put it into a pan then put it into the fridge. The filling- Mix the tofu, the honey and the compote. Add the melted cocoa butter, the vanilla and some drops of pineapple essence and the chopped pineapple. Pour it over the counter top and put it into the fridge. The jelly- Boil the compote for 2-3 min. 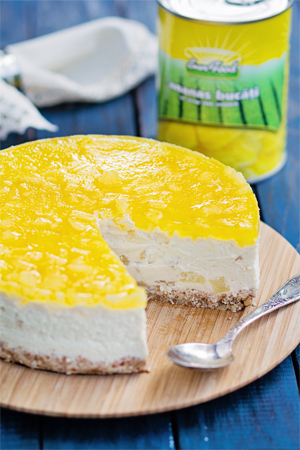 dip the gelatin foils in cold water for 5 min then add them into the compote.Take the cheesecake from the fridge and put the chopped pineapple over it. Pour the jelly. Put it into the fridge for 4-5 hours.